Mercedes Benz’s ‘PRE-SAFE’ system is available as an option on the GLK. The system senses when an accident is about to occur and primes the restraint and protection systems in readiness for the collision. The system was not fitted to the test cars in Euro NCAP’s assessments. The passenger compartment remained stable in the frontal impact, the windscreen pillar moving rearwards by only 3mm. Dummy readings indicated good protection of the knees and femurs of both driver and passenger. Mercedes were able to demonstrate that occupants of different sizes, and those sat in different seating positions, would have a similar level of protection against upper leg injuries. Maximum points were scored in the side barrier test. In the more severe side pole test, protection offered by the chest was rated as marginal. Protection against whiplash injuries in a rear impact was also rated as marginal. New pedestrian tests have been done to upgrade the rating of the GLK from 2009 to 2010. In the new tests, the bumper scored maximum points for the protection it offered to pedestrians' legs. However, the front edge of the bonnet was rated as poor. In most areas likely to be struck by the head of a child, the protection offered by the bonnet was poor. In those areas likely to be struck by an adult's head, the protection was predominantly good. 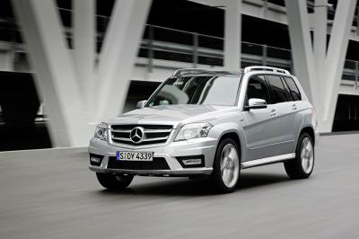 The GLK is equipped with Electronic Safety Control (ESC) as standard equipment on all variants. A seatbelt reminder system, covering both front and rear seats, is also standard equipment. A driver-set speed limitation device is standard but Mercedes did not ask for the system to be assessed by Euro NCAP. The rating of the GLK has been upgraded from 2009 to 2010. The car is unchanged and, apart from the pedestrian tests which have been repeated, test results have been carried over from the previous year. However, the thresholds for the different star ratings have been increased and this assessment shows how the car rates against the more demanding 2010 requirements.